Midsize crossovers might not be the most glamorous segment but in the last five years, thanks to some new tech and styling, they certainly feel a whole lot cooler. The Nissan Pathfinder is one such crossover, loaded with driver-assisted tech, media and a whole lot of space. The competition is tight, though, with competitors like the Honda Pilot and Toyota Highlander vying for your attention. We compared all three in order to help you make a more informed decision when it comes time to buy. For a midsized crossover, the Nissan Pathfinder has some serious oomph. Thanks to a V6 engine that delivers an impressive 284 of horsepower and a CVT transmission, the Pathfinder can tow up to 6,000 lbs. making it a great choice if you want to haul a camper or boat next summer. The Honda Pilot also houses a V6 engine, however, the nine-speed automatic transmission it’s coupled with doesn’t make the most of its available power. Thus, you get a smaller towing capacity. The Toyota Highlander only tows 5,000 lbs. which still falls short of the Pathfinder’s 6000 lbs. towing capacity and pushes the Pilot to the bottom of the list. While the Toyota is a little quicker off the line than the Pilot and Pathfinder, it’s not by much. Realistically speaking, striking performance race-car-like like speed aren’t qualities you typically shop for in a full-sized SUV anyways. However, if you’re looking for something that can tow the toys on the weekends, the Pathfinder is most certainly the best pick. The Nissan Pathfinder is the spacious seven-seater SUV you’ve been shopping for. With 42.2 inches of leg room in the front and 41.7 inches in the back, even the tallest passengers can brag about its roominess. The Honda Pilot is a bit more snug, offering only 40.9 in the front and a measly 38.4 in the back. The Pathfinder also offers a reclining third-row for added comfort and an easy-tilt option to slide the second row out if needed. While the Pilhavedoes has room for eight, space is tight. 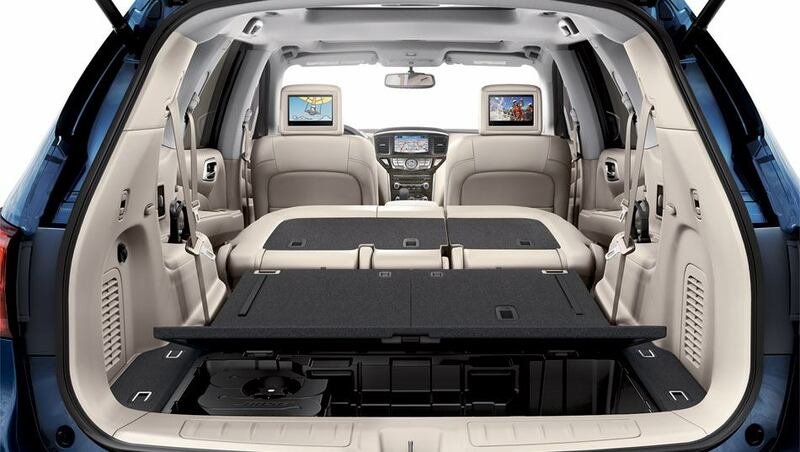 Overall, the backseat offers more space for passengers to stretch out in the Pathfinder thanks to more leg and headroom. The Pathfinder bests the Highlander in both passenger space and cargo capacity, too. The Pathfinder is 1.5 inches wider and six inches longer than the Toyota Highlander which ultimately means more room for passengers. In terms of cargo space, the Nissan Pathfinder features more cargo space than the Highlander at 458 litres (which is almost 60 more litres)! And trust us — that can make a big difference when you’re piling in all the kids’ hockey equipment. The Pathfinder got a facelift in 2017, with Nissan packing it full of driver-assisted features like Automatic Emergency Braking and a new feature on the rear door that lets you know if you’ve forgotten anything inside. The Pathfinder offers tri-zone entertainment with 8.0” monitors in the second row that are both smartphone and tablet compatible. This will save your life during long summer road trips. Upfront, the Pathfinder offers a touch-screen display on the dash and Bluetooth compatibility so you can ditch the aux chord once and for all. Comparatively, the Honda Pilot is similar, with an 8” Display system up front and Apple CarPlay and Android Auto. However, Nissan’s Intelligent Mobility gives Pathfinder drivers’ greater awareness of their surroundings. Meanwhile, the Pathfinder’s advanced Drive-Assist Display is also incredibly useful for navigating new territory, and the Motion Activated Liftgate automatically opens to give easy access to the SUVs versatile interior. In terms of safety tech, all three SUVs are fairly evenly matched That means standard driver and passenger frontal airbags, front side-impact airbags, and side-impact head airbags are included. There’s also height adjustable front shoulder belts, four-wheel antilock brakes, traction control, crash mitigating brakes, daytime running lights, rearview cameras, available blind spot warning systems, around view monitors and rear cross-path warning across the line. Oakville Nissan houses a wide selection of new Nissan vehicles including the 2018 Pathfinder. 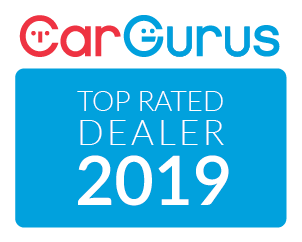 We have the largest Nissan showroom in all of Ontario and our dedicated team of sales associates have over twenty years of experience between them. They can help you find the right car, truck or SUV you need. Shopping in Oakville, Burlington, Milton, and the GTA and need help choosing between the Pathfinder, Pilot, and Highlander, visit us at Oakville Nissan and let us walk you through the differences between the three. 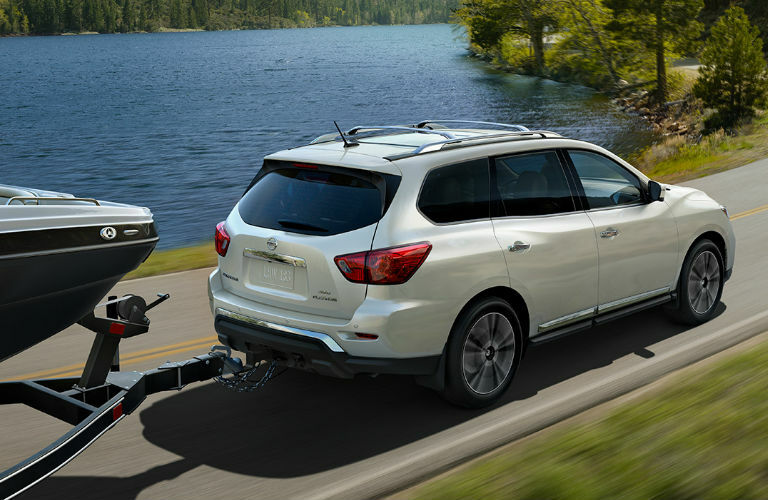 If you’re looking for a versatile family-hauler that also has the power to tow and makes sure even your tallest passengers feel comfortable in the back, the 2018 Pathfinder is the choice for you.